I do love a good op-shop find, i enjoy the feeling of finding something very special - something you didn't even realize you where looking for - for a very bargain price. 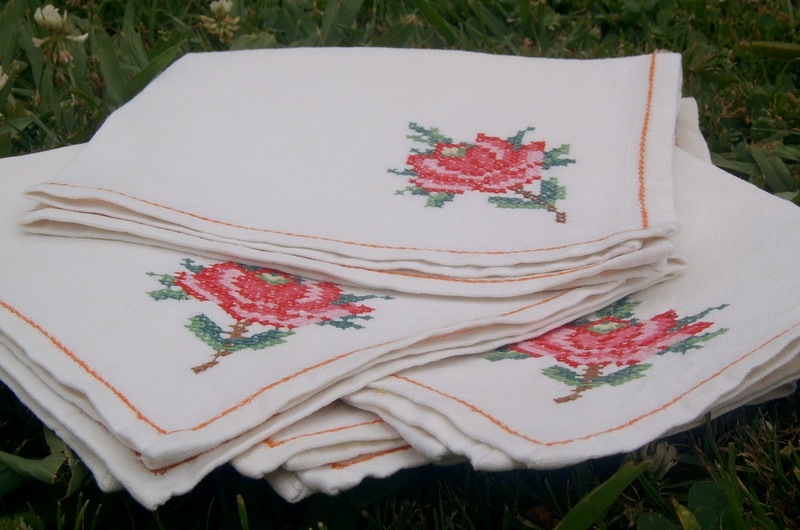 I found these very pretty little embroidered napkins recently in the small town were i grew up, aren't they lovely? I got all six of them for a mere $1.50 & they were mostly in good condition (nothing that a little soak in napisan didn't fix). I like to imagine that some lady (or quite possibly man!) spent a lot of their evenings hand embroidering the beautiful roses & border on each one for a very special wedding present. When i first found them i was intending to cut them up to make some goodies......but i just can't bring myself to put the scissors anywhere near them. I think they'll be perfect for my next little tea party.